How surprised were we to find that it’s one of the most enchanting cities we’ve visited? Built over seven hills bordering the River Tagus, Lisbon is a combination of neighbourhoods that tumble into each other. Each boasts its own vibe from the fashionable area of Chaido with its shopping and museums to the café lined boulevards of Baxia which lead to the grandoise Praça do Comércio. 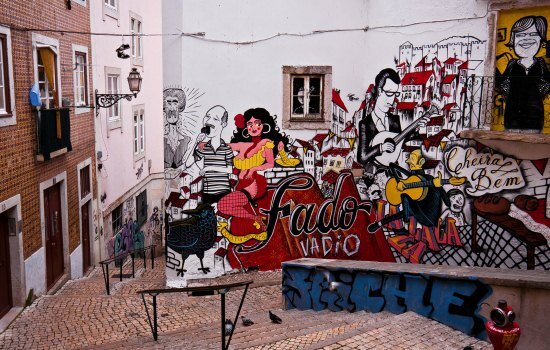 The old neighbourhood of Alfama is Lisbon’s ancient heart with its precipitous sloping streets, historic churches and castle whilst the Barrio Alto, a sleepy residential area by day, comes alive at night as locals fill the bars and hip hangouts. Lisbon doesn’t have the wows in terms of sites, as other cities do, but that’s actually quite nice as we didn’t feel pressured into spending the weekend ticking them off the list. Instead Lisbon has something that most capital cities don’t, a laid back vibe; we eased ourselves into the relaxed way of life and absorbed a city that’s soulful, vibrant and above all totally Portuguese. This is the biggest and cheapest delight. Lisbon is a place of hidden gems that unfold as you wander its pavements, prettily cobbled in black and white mosaics. Around every corner are unpretentious buildings clad in distinctive hand painted ceramic tiles that come in a myriad of colours and patterns; these sit happily next to crumbling and decayed graffiti scarred facades. Lisbon is certainly not a pristine city but it’s more shabby chic than down at heel and it really does add to the charm. It’s a delight to stumble across Lisbon’s artisanal shops which appear frozen in time. They are all utterly gorgeous and full of character, whether it’s a candle-making shop, a shop so small that only one person can enter at a time to peruse pretty handmade leather gloves or my favourite, one that stocks a jaw dropping array of tinned fish all wrapped in bright retro paper and neatly stacked; the charm of this place is that everything inside - wooden shelving, the till, counter tops - has remained untouched since the shop opened in the 1930’s; except the fish of course. This is probably Lisbon’s prettiest district. It clings to the hillside in the shadow of the Castle of St George; a maze of narrow alleyways and steep steps which offer wonderful viewpoints (miradouros) over the terracotta roofed houses that cascade down to the river. Save your legs by hopping on the pretty vintage tram (the no 28) as it clatters through the streets winding up to the cathedral and the castle beyond. On a Tuesday and Saturday you can browse the treasure trove of bric-a-brac at Lisbon’s most famous flea market, Feira da Ladra (the Thieves market). Located 6km from the city centre (easily accessed on the no 15 tram), Belém (Portuguese for Bethlehem) is the site where the great Portuguese explorers set off to discover new lands. Visit the gothic style Monastery of St Jerome andclimb the winding steps of the Torre de Belém to see the panoramic views from the top of this stone tower - both are UNESCO World Heritage sites. Admire the Padrão dos Descobrimentos (Monument to the Discoveries), a 52m high concrete monument by the riverside and take in the art exhibitions at the Centro Cultural de Belém. This is a lovely place to stroll along the river and you must stop at one of the cafés for Pasties Belém, a delicious custard tart sprinkled with cinnamon, a national delicacy. For dining out Lisbon has a whole gamut of fantastic eateries from Michelin starred restaurants to chic bistros or more traditional establishments. We liked the little neighbourhood eateries in the Santos district where young locals shared dishes of finely tuned traditional Portuguese food selected from chalk boards and served on a mismatch of vintage crockery. Fresh fish and shellfish are found on virtually every menu. The national dish is bacalhau dried, salted cod and the Portuguese have been obsessed with it since the early 16th century, when sailors salted and sun-dried their catch to make it last the journey home from Newfoundland. A revelation to us was the delicious wine on offer, particularly from the nearby Alentejo region. We didn’t have time to travel further than Belém but, speaking to the locals, Sintra is enchanting. Formerly the summer bolthole of the Portuguese monarchs it has an almost fairy tale feel with its misty forest, richly coloured palaces, turreted Palacio Nacional de Sintra and Moorish castle that overlooks the sleepy village with its historic centre, another UNESCO World Heritage site. If you want some beach action then head out to the pretty seaside town of Caiscais, about 20 minutes from the centre of Lisbon. It’s an active fishing port with an attractive old town of narrow winding lanes and vivid coloured fishing boats that bob around in the harbour. The big draw here is the sandy beach flanked by walkways and outdoor cafés; it’s a favourite among weekending Lisboêtas and so has a youthful air and a cosmopolitan atmosphere without losing its local flavour. Lisbon, while a city of contrasts, is more importantly a city of balance which seamlessly mixes the traditional and the modern. The whole city and its environs are easily accessible on foot or by the excellent network of trams and trains. We thoroughly enjoyed our few days in the city; we had time to relax but also managed to get under the skin of the place. So if you’d like to try something different for your next weekend break the Hubby and I would whole heartedly recommend Lisbon - we certainly left wanting to return. Just make sure you pack comfy walking shoes! If you’d like more information on Lisbon or would like me to take away the stress of organising your next weekend away please contact me for a chat.